“What’s that treatment with the crazy capillary thing?” -someone who has just seen one of our amazing plasmatic effects! Today we will be delving skin deep into the how’s and what’s of DMK Enzyme Therapy, or famously known as The Game of Thrones Facial. DMK Enzyme Therapy is a hard setting face and body mask that is applied from the décolletage, up the neck and over the face. The mask contains living enzymes that stimulate our own natural enzymes to speed up cellular processes within the skin. The downward pressure of the mask stimulates the circulatory system to pump fresh oxygenated blood throughout the capillaries, dilating them and creating what we call the Plasmatic Effect (the crazy capillary thing). Plasmatic = Plasma + Blood. This action means that our cells are delivered fresh nutrients and oxygen which gives our skin a ‘spring clean’ by removing toxins, stagnant blood, lymph build up and dead cell material through the lymphatic system. Unlike other skin treatments, DMK Enzyme Therapy aims to revise the skin’s conditions and rebuild and maintain healthy functioning skin. This is the complete opposite of the other stock standard treatments like Microdermabrasion and constant peeling of the skin. These treatments are only removing from the skin, not rebuilding a healthy skin for long term results. We love the customised approach DMK offers with their treatments, just as every finger print is different, so are our skins - no one is alike! Every treatment you have with DMK will be different to the last and customised to suit what your skin is presenting with on the day. 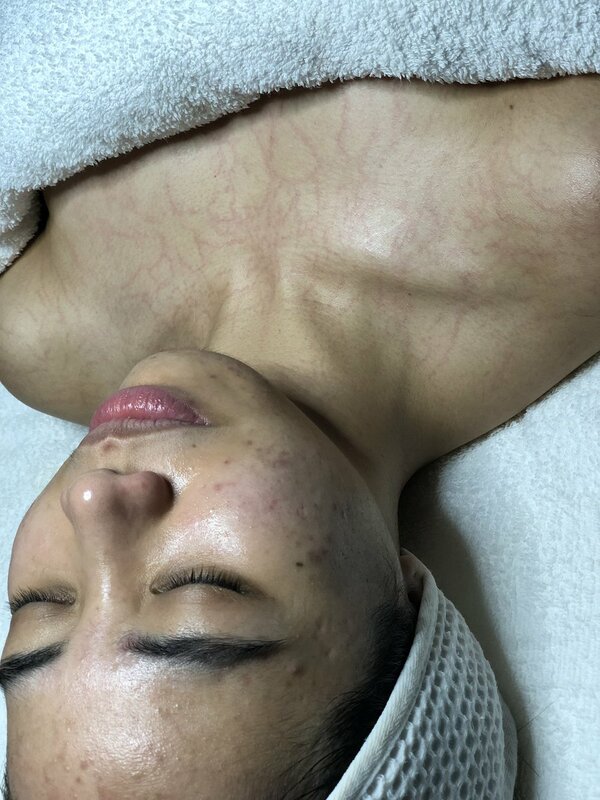 Post treatment, a plasmatic effect can be seen (some skins take a few treatments to be visible) and will go down within 20 minutes. So not to fear, you won’t be facing the world looking like a White Walker.. but you WILL be glowing and looking super fresh! In every one of our consultations we customise a treatment plan to suit your skin goals! We recommend that your first two Enzymes are one to two weeks apart to kickstart the oxygen flow through the skin and increase the skin’s cellular processes. DMK Enzyme Therapy plays a big part in the success of creating healthy skin in our clients. It has the best benefits of all - happy skin and happy clients who feel comfortable in their own skin.